I am proud to say that I knew Elisabeth Beckett over many years. Elisabeth Beckett, who has died, intrigued us with her knowledge and mystical insights and immeasurably enriched our understanding of the British Constitution. By her example she showed what it means to fearlessly defend justice and freedom. We spoke with her several times by phone and first wrote about her a little more than a year ago, after she had discovered that her local council’s money was being used to fund a European Union-dictated regional assembly. To protest the expenditure of money for a foreign-mandated assembly that she understood had no standing under the British Constitution, Elisabeth refused to pay her Council taxes, and appealed the matter to the High Court. In response the government brought all its power to bear on Elisabeth, who at the time was 83. She received numerous letters from council officers and visits from bailiffs to the Old Vicarage in Alston, Cumbria. 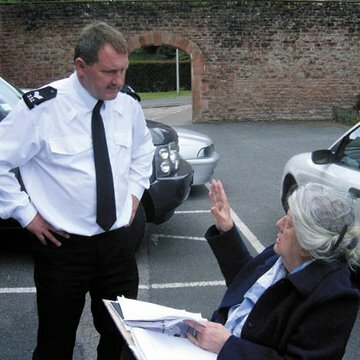 Elisabeth hands a response to a Police Sergeant from her wheelchair. The mother of two daughters and two sons, Elisabeth was the daughter of Ronald Brymer Beckett, an administrator and judge in India, and Norah Anderson Beckett. In a second career, as an art historian, Ronald Beckett published a magisterial edition of the correspondence of John Constable. Last year, Elisabeth laid charges of treason against Gordon Brown at the Newcastle Magistrates Court on the ground that the Prime Minister had forced The Queen against her Coronation Oath to agree the Lisbon Treaty (the EU Constitution). These were exhausting trips for Elisabeth, who must have been growing weak even then from leukaemia. At the time we were afraid that the wheels of justice would grind exceedingly slow, and so it has proved. Elisabeth’s last act, from her deathbed, was to write a letter to The Queen. We published the letter, which reflects Elisabeth’s devotion to her country’s freedom and her disappointment with those she felt had failed to defend Britain. “I am old and now seriously ill.
On the 7th of February, Elisabeth drifted out of life in her sleep, into that long goodnight – after a life striving for better she died peacefully. In fighting against an unjust tax and in denouncing treason, Elisabeth was not alone, and she is not alone in history. Elisabeth’s campaign was immensely aided by Leolin Price, QC, Hedley Lester, Namaste Magazine and others, whose names we do not know, who voluntarily stepped forward to help her. It takes a degree of courage and fortitude to resist unjust law. Elisabeth had both. I spoke with her son Beau shortly after her death in her own home in Northumberland on Saturday last, shortly after 16.00hrs. He was hugely relieved in that he had left her earlier in the day to do a ‘sprint’ to the railway station to collect one of Elisabeth’s grand daughters – he told me that a part of the morning the end was clearly close but she had relaxed towards that ‘long goodnight’ yet it seemed as if she had been determined to hang on and it was shortly after a kiss from her grand daughter that she quietly left us. TO CONTINUE the fight for our Country, our liberty, our values, our Justice, our Sovereignty and our children’s future. ELISABETH set the example I hope you will all feel we must follow – Elisabeth, like me was not a UKIP member but both of us supported UKIP whenever possible and many were the discussions I had with her how we could try to keep UKIP on the straight and narrow to serve our Country. It is sad that when Elisabeth died UKIP was in disaray and had become a self serving vehicle for the egos and the pockets of a few. Perhaps those who seek their own gain through EUkip might consider expending less effort to protect corruption and smearing those who still support the principles and aims of UKIP that they have most clearly abandoned for their own gain in a stlye more fascist than even their BNP contacts and associates would espouse. Elisabeth was a dedicated, obsessive and infuriating friend and Mother who could act with great wisdom and be very foolish, yet have great generosity fettered by a selfish determination. A hard act to follow but an inescapable force for good who always sought to bring people together in her common cause but would not tollerate corruption – where needed she exposed such corruption by giving it a platform! I well remember meetings Elisabeth organised in Calne – they were packed Bob Lomas, Dr. Richard North, Norris McWhirter, Edward Fox, Bernard Connolley, George Eustace, John Gouriet and many others spoke – so also did a director of the NFU and what a fool he made of himself, MAFF was exposed for what it really is! I had the pleasure of speaking for her at a couple of her meetings and recall a bizarre meeting in what seemed like a dungeon in Glastonbury to an audience of pierced and tattooed new age supporters of leaving the EU – one expected some ‘horned beastie’ to materialise at the back of the room to denounce us all and thunder out the evil mantras of the then EEC – I well remember Elisabeth finding the idea a little too real during the coffee break! It was a long day with an hours drive back to Chepstow, shortly after dawn when the questions ended! Elisabeth will loose a huge hole in many lives as she was a huge personality but as the years pass it will be easier and safer to approach that hole. It is a Chinese trueism that you are alive for as long as you are remembered – Elisabeth will remain alive for as long as Britain has its freedoms. I am hoping to ensure Elisabeth lives on studying the text of the book she wrote on Amritsa and texts on Ghandi. It is easily forgotten that as a young woman she travelled extensively with her Father in India, meeting Jinnah, Ghandi, Nehru and other worthies of India’s recent history and Judge Ronald Beckett did all the groundwork drafting of India’s Independence Constitution and outlined possibilities for Ali Jinnah’s Pakistan. I was in no small way a product of Ronald Beckett’s Constitutional work living in the days of Mountbatten as Viceroy and his wife’s ‘strange’ behaviour – a subject Elisabeth and I discussed several times. My thoughts are with Diana, Beau and Sabrina whom I know and with her other son and various grandchildren. Elisabeth had said for several years she would not die until she was 84 and ever true to her word when 84.1/2 her life ended in a brief period of Leukemia that left her largely sleeping her way out of life, but NEVER forget her example in a letter to The Queen during her last week. Not a letter for herself but for the rights of us whom she leaves behind. Farewell Elisabeth – Thank you my life was enhanced by having known you and seen your example – good luck to her family and let us hope something can come of her writings, for posterity. Fulfill Elisabeth Beckett’s dreams and reform The Family Courts and leave the EU, restoring the confidence we HAD and which UKIP supporters honestly believed they could repatriate. PS. Having now read her books in CD format I now hope that they are published in the future so do look out for them!